Chow Down Seattle: FOOD EVENT: Mobile Food Rodeo Over Two Days! FOOD EVENT: Mobile Food Rodeo Over Two Days! This edition of the Mobile Food Rodeo is two days, in two neighborhoods, and features over 60 food trucks! This Food Truck event is so big that one day and one neighborhood wasn't enough to handle it. The food truck festivities begin Saturday, May 3rd from 5-11pm in the International District, and they continue Sunday, May 4th from 11am-7pm in Fremont. Both days will feature the Taco Libre Showdown. Twenty five Seattle taco trucks face off for your votes. The Showdown will also feature live mariachi, luchador wrestling by Lucha Libre Volcanica and live entertainment. You can't have a big Food Truck event without some good drinks, right? Well this year's event will have a beer garden with margaritas and beer. 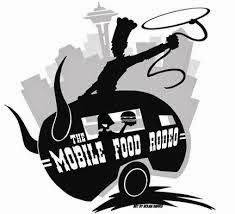 Check out more information on the Mobile Food Rodeo at their official website. Below is a listing of all the Food Trucks for each day. Go out and get some good food!